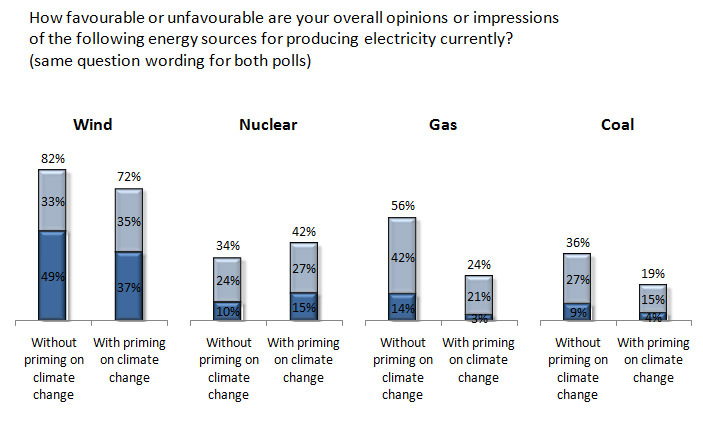 Both polls asked a similar question about favourability to different forms of power generation. However, while the Understanding Risk poll asked their question right at the start of the questionnaire, EDF asked theirs after a question about global warming and climate change. While I’m not suggesting that they did this with the intent of skewing the result, the comparison between the results is striking. While wind and nuclear power receive about the same scores (indeed, wind goes down and nuclear up by 8-10pts), coal and gas do much worse when they’re asked of people who’ve been primed to think about climate issues. So, the first lesson appears to be that nuclear is seen as a source of energy production that doesn’t contribute to climate change – and this is a strength, so nuclear does better relative to other sources when this is raised as an issue. 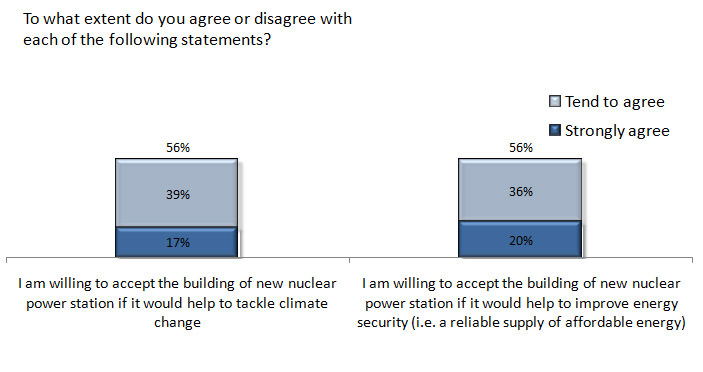 So, nuclear starts is initially pretty unpopular, but has the potential to become much more accepted if the case is made based on tackling climate change and improving energy security. To be clear, this doesn’t overcome all doubts. Both of these arguments are challenged when nuclear is put directly in comparison with renewable sources, which remain far more popular until the case has been made convincingly that all other options have been exhausted. 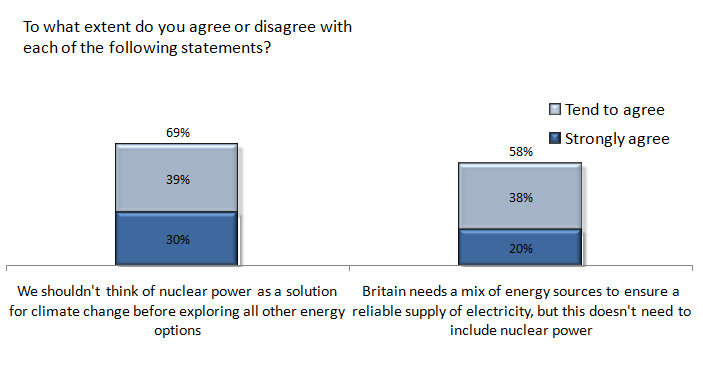 So the results appear to show that there is a case (tackling climate change and improving energy security) that makes nuclear more accepted than other non-renewables (of course, I haven’t explored the impact of the pro-coal and pro-gas arguments…). But nuclear would still only be grudgingly tolerated, not embraced like renewables, and there will be a powerful local resistance to any new plants. This entry was posted on Sunday, July 4th, 2010 at 19:12	and is filed under Climate Sock, Energy sources. You can follow any responses to this entry through the RSS 2.0 feed. Both comments and pings are currently closed. ex PM Gordon Brown’s brother is known to have been employed by EDF Energy (last time I checked) which as we know is a big player in the Nuclear Power market. Nuclear fuel is finite anyway, and there are only a fewmine globally, will be getting in to new wars around the world under the banner of “Energy Security” in order to secure nuclear fuel next?